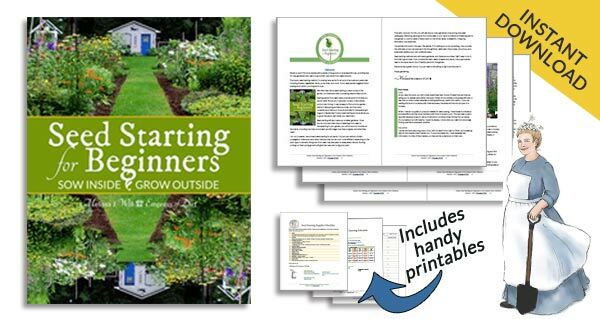 Put your garden to bed! 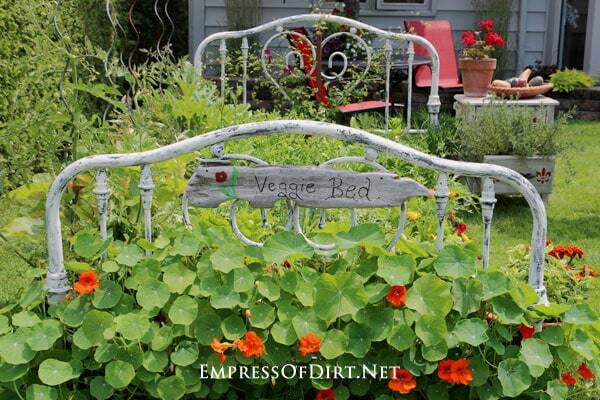 Come see how this creative gardener took an old metal bed and turned it into a fabulous veggie garden. 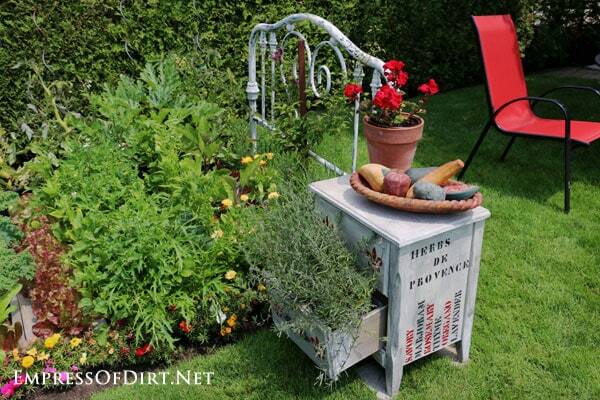 Love repurposed garden art? There’s plenty of garden art ideas here. 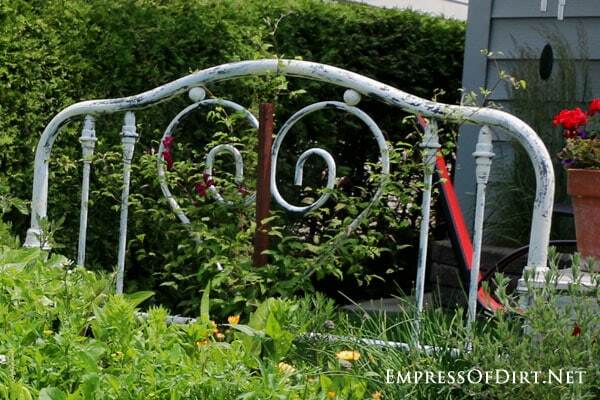 My name is Melissa the Empress of Dirt and I am a garden tour junkie. I love garden tours. I think it’s incredibly generous of gardeners to open up their yards for these tours and I’m sure it’s quite nerve-wrecking to face crowds of people with no shortage of opinions or questions. Yes, there’s lots of praise but I’m sure there’s also many sharp tongues and thoughtless comments too—I know because I overhear them. So, if you’re someone who has hosted a tour, I salute you, thank you, and you inspire me! I always come home from these tours all excited to try some new ideas. 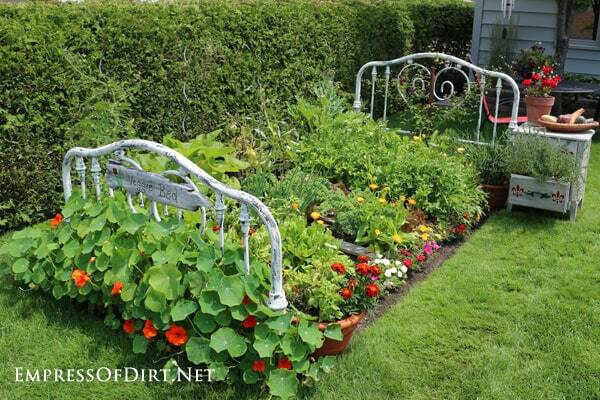 This bed frame veggie garden is in the front yard of a beautiful lakeside town here in Ontario. The tour was very busy and I could only wait so long to approach the homeowners to see if they would like me to mention them in this post. I never got a chance to ask (we were short on time and would have missed the rest of the tour if I delayed any longer) so for now I will keep it anonymous. If I get permission later, I’ll add it. This gardener is wonderfully creative. 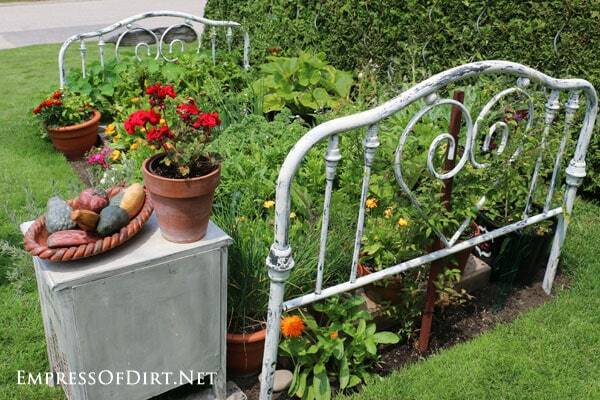 You’ve probably seen this turn-an-old-bedframe-into-a-garden-bed idea before. I just thought this one was really nicely done. As I mentioned, the tour was super busy and I could barely get some shots without lots of people in the scene. I do my best to keep the images people-free so I am not invading anyone’s privacy or interfering with their enjoyment of the tour. But it also means pictures are taken in a hurry and sometimes the composition is a little odd. 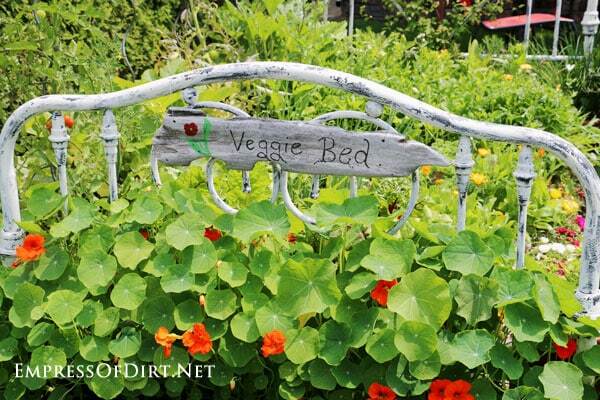 That said, let’s look at this veggie bed bed. Or bedframe bed. Or however you want to say it. 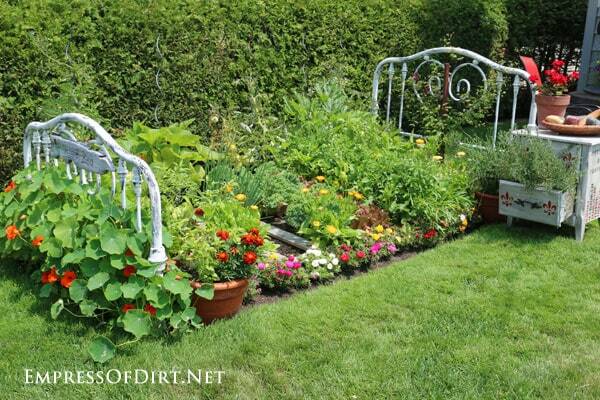 The garden bed is displayed like a bedroom, complete with a side table. It’s planted with lots of herbs and veggies and nasturtiums. Honk if you love that orange colour as much as I do! I always forget to plant nasturtium seeds and then regret it by mid-summer. I really don’t think the pictures do it justice. This garden is very pretty. 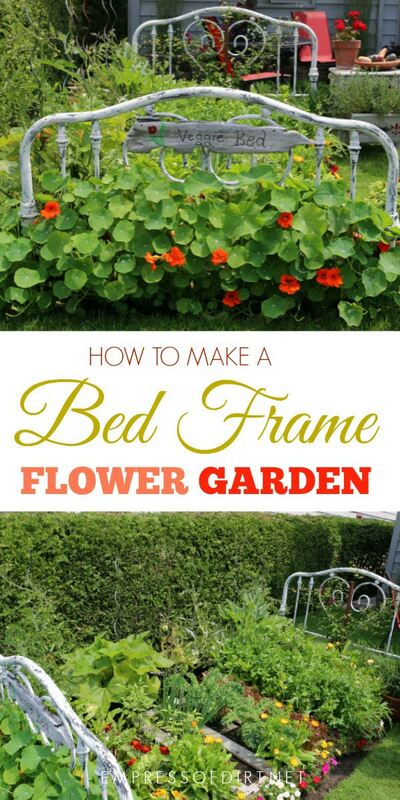 If you want to make your own bedframe garden bed, notice that the headboard and footboard are here but side bedrails are not. You might get a good deal on these pieces at a yard sale or thrift shop if some of the pieces are missing. I mean, how many shop owners think someone could turn these two pieces into a cool veggie bed so I’ll charge a higher price, right? Act like you’re doing them a favour and then take your treasures home. Here’s how it looks from behind the headboard. 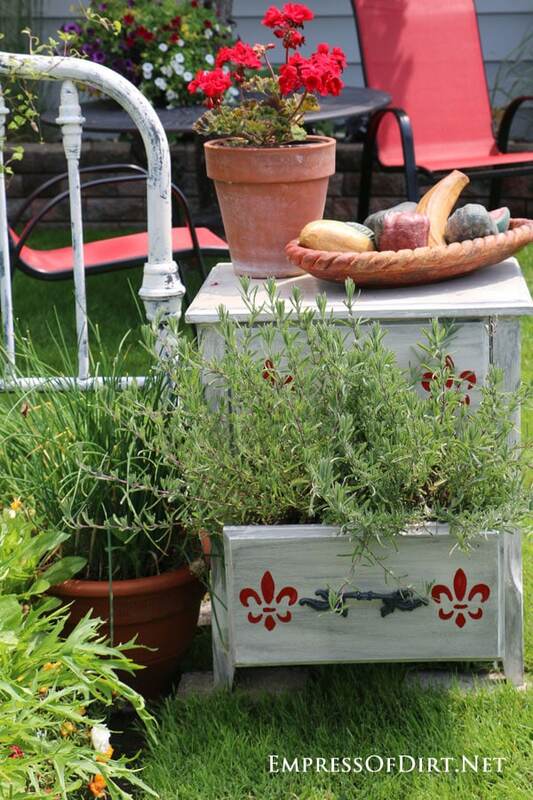 The side table / dresser is stenciled with a French theme featuring the names of herbs. Rosemary is spilling out of the drawer and there’s a pot of chives beside it. It’s so nicely done and I love it even more because it is in the front garden. Having come out myself as a front yard veggie gardener, unsure of how neighbours would respond, I love this show of functional creativity. Now I’m totally on the hunt for an old bed. Love this idea, in fact a house has one in her front garden on one of the roads we take to get into town. So stinkin’ cute. I love it!